Missionaries live with limited resources. 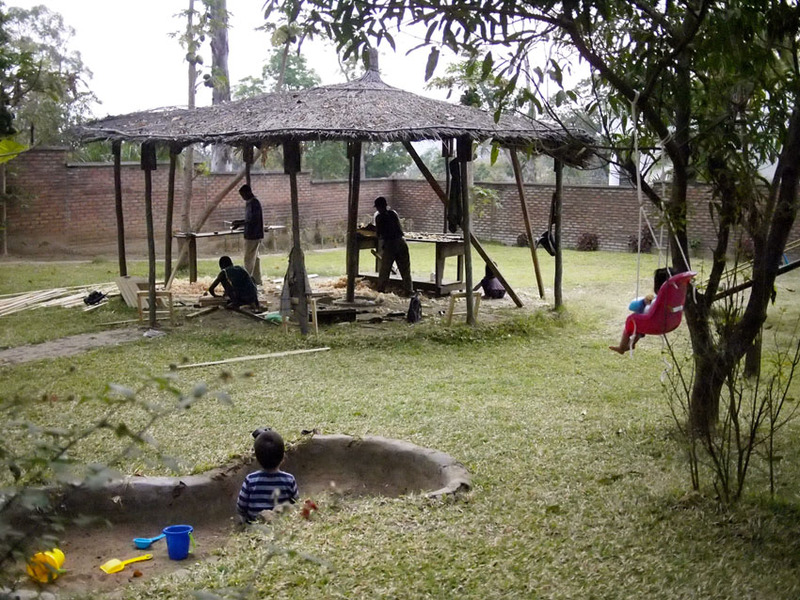 'Good' missionaries live in mud huts. Or so some may think. Or expect. Sure, we have had to give up a lot to move here to Malawi. Some we have slowly learnt to live without, and some our hearts still ache for everyday. Living here in Malawi has come with sacrifices but let me share a secret with you - God has been blessing us tremendously since we got here, way more than we could ever have imagined. So much that sometimes we feel a bit spoilt and underserving! The temptation is great to try to uphold this 'poor missionary' image, to hide times when God blesses us immensely with things that we may even feel guilty about, esp living in the midst of poverty. Hey, we don't want people to think we're having a holiday, right? People expect to hear stories of suffering, right? They'd be more interested in praying for us if they thought we're doing it tough, right?? Why are we enjoying ourselves? Aren't we supposed to be 'suffering for the Gospel'?? The more suffering they think we're going through, the 'better' a missionary they'll think we are, right? WRONG. The more I reflected on God's blessings over the past 2 months, the more I was convicted that it is not right to share selectively, to share only the sufferings but not the joys, or up-play the sufferings and down-play the blessings, because that would not be an honest account of how God is blessing us. Small blessings, big blessings, they all help paint a beautiful picture of the awseomely generous and gracious Father that he is. Imagine if the writers of the Bible kept all the best blessings a secret. I think we might all be in a bit of trouble! Don't get me wrong. There are defintely times of trials and 'suffering', It is all part of the life of someone who follows Christ. I have had my bad days, days where I wished I was back in Australia, I have had my cries. But above all, God sustains us and he is good, and for now, I just want to give him the glory for that! We want people to know how awesome God is and how much he has looked after us here, way beyond our expectations. All glory be to him! ...Gelato Carnival. A place like no other that has given our kids something to look forward to on Saturdays, something to distract them from missing ther usual Saturday-with-Grammy routine. They have delicious gelato there (the dark chocolate gelato is so good that I have no choice but to go off my sugar-free diet on Saturdays!). They have kids rides (mini-train, mini ferris wheel, 'flying dinosaurs') for 200MKW a ride, less than AUD$1. They have a jumping castle and a playground. In a city where there's not a whole heap for little kids to do to have fun (no Westfields centre court shows, no holiday shopping centre kids crafts, no Lollipops playland, no parks with playgrounds, no McDonalds, etc), it has been a massive blessing to have this place nearby (5 mins from our house). We discovered it not long after Teagan said: "I want to go back to Australia, there is nothing fun to do here". This has been a real God-send. A huge blessing. Such a great feeling to see the kids laugh and enjoy themselves again. ... The kids' school - St Andews International Primary School. There weren't many options when we were looking for a school for the kids. We chose SAIPS because a lot of the other SIM kids also go there so would make carpooling easier when there is a fuel shortage. We didn't know a lot about the school but we trusted God with it and left it in his hands. One of the things that we were sad about when leaving Sydney was the thought that our little Aussie kids won't have the opportunity to learn to swim here in Africa, either due to the lack of facilities (our ignorance!) or our lack of funds. We counted that as one of the sacrifices of serving God in Malawi and left it with our heavenly Father, knowing he knows our hearts and our desires. Little did we know that SAIPS has two swimming pools! A lap pool and a beginners pool. Swimming is part of the curriculum with Lucas having one lesson a week in nursery and Teaghan two lessons a week in Year 1. WOW WOW WOW! A blessing way beyond our dreams! The kids are loving school and have not cried a single tear - most uncharacteristic of our kids! A huge blessing and huge answer to the prayers of many. Do we want to satisfy people's expectations with stories of 'suffering missionaries' or surprise people with stories of God's goodness? Some say that living as foreigners here in Malawi is like living like a king. I hope that has added a stroke or two to your own painting of our awesome provider God! Pete has been busy coordinating with different workers the things around the house that need to be fixed - electricals, installing masquito screens, fixing broken lights for security... as well as tidying up unfinished business back in Sydney (cancelling mobile/internet contracts, etc). He was recently initiated into Malawi by receiving a 11,000kwacha (AUD$38.5) fine for not having a Malawian licence (we have since found out that it was a bogus fine as by law we have 3-6 months to obtain a local licence). Pete has enjoyed interacting with our guard and carpenters and talking to them about their faith. 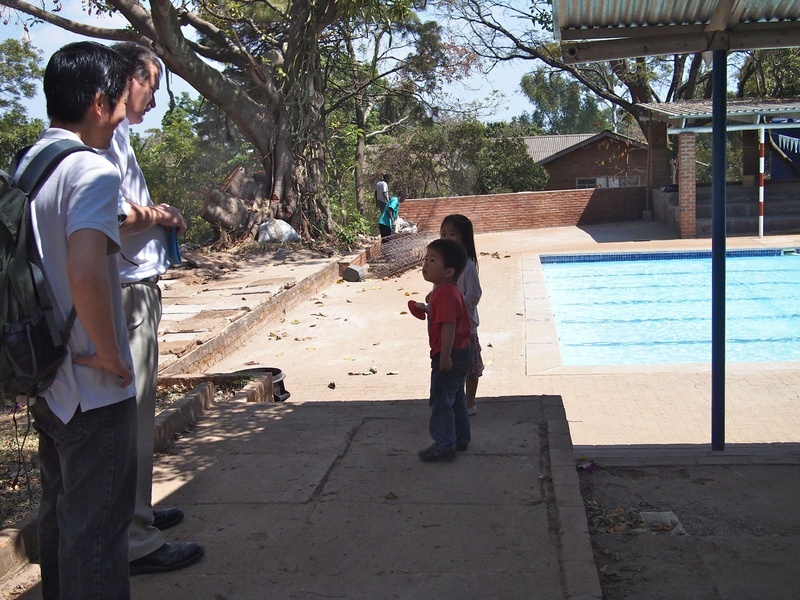 He also recently visited the youth sports ministry run by another SIM missionary and was encouraged to see the Malawian youth having a real heart for learning about God's word. Our heavenly Father continues to care for our sensitive big girl. She has really missed Grammy over the past few weeks, crying most days and screaming in her sleep. But thanks to the prayers of many, she is getting better and now able to talk about Grammy without crying. She will start Standard 1 on 4th September at St Andrews International School, her teacher's name is Miss Berry. She is excited yet apprehensive about starting at a new school. Teaghan has shown a real aptitude for learning a new language, often surprising us by using some of the Chichewa phrases she's heard us speak. She is keen to take Chichewa lessons with our language teacher. Lucas is loving the dirt here in Malawi where he can play with his cars and make tracks. His behaviour has settled tremendously since first leaving Sydney, with a lot of the daily tantrums being replaced by just the usual 'boyness' - running around, being noisy, being rough, annoying his sisters, etc. He has been sucking his thumb less and not needing his speical 'alien blanket' as much which shows he is feeling more secure. He loves to roll down our car window to 'hear the cars' and say "Mulibwanji" (How are you?) to locals passing by. Lucas appears to be popular with locals here, with Malawians often wanting to stop and greet him! Maybe its his bouncey cheeks! Praise God also that Lucas has taken a real interest in praying and singing God-songs. Caya contnues to be her friendly self, always wanting to wave and say "heyo" at anyone and everyone passing by, which is proving to be a great conversation starter. She has mastered standing up herself and can take one step on her own! She is speaking more and has a few words in her vocab not besides "Mama" and "Daddy, she now also says "I know" "uh oh" "water" and "what's that?". She is even picking up some Chichewa and says "nana!" when we say "tionana!" (bye/see you) to people. She had her first Malawian hospital experience after getting sick from eating dirt from a flower pot. Caya has taken a real liking to our day guard Dickson (father of 2 young kids) and enjoys playing with him and is happy for him to carry her around the yard. - New friendships for us and for the kids. - Good school for the kids. - That we've been able to get around by ourselves and finding out where to buy things. - Great new SIM Malawi family. - That we are nearing the end of our setting up home. - We'll need to go get our Malawian licences in the coming month or two. We may need to do a road test, or we may not. It is totally random and depends on the person at the roads and traffic authority on the day! Please pray especially for Jo to increase in confidence in driving manual. - Lucas had a bad slip in the bathroom last week which has resulted in a traumatised tooth which has started turning grey. Google tells us that is not a worry right now but should be monitored for abscess in which case extraction or root canal may be necessary. In most cases the tooth is restored to full health on its own. Please pray for that. - We are excited that we will begin our language classes on 10th Sept. Please pray that we may have humility and patience as we learn. - Kids start school 4th September. Please pray as they settle into the new school routine. Classes go from 7:15am-12pm with one break in between. Teaghan will be going 5 days and Lucas 3 days at this stage. - Pray that Teaghan will make friends at school. She finds it a challenge to make friends in big group settings. - Pray as we consider buying a 2nd car sometime in the future. We do not need one right now but may need one later when Pete starts ministry which may include travelling to rural areas. A 2nd car will enable Jo to take the kids to school and do grocery shopping, etc in Pete's absence. This will need to come out of our personal funds. Please pray for the sale of our car back in Sydney to enable the purchase of a 2nd car if we choose to get one. Mulibwanji (how are you?) from Malawi! We have been here for a month now. How time flies! In some ways, it has been every bit as overwhelming as we had expected. In other ways, it has also been a little less stressful than we had expected. Thanks to the many who have been upholding us in prayer. We are loving it here, it is a beautiful country with wonderfully warm people. We are loving getting to know the culture and picking up bits of simple Chichewa. We will commence our formal language studies soon. We are slowly furnishing our new home, one piece of furniture at a time. We currently have a carpenter and his 2 sons working on our furniture and living in our backyard (in the 'workers quarters' - a common feature of houses here). When one fo my friends went on the mission field years ago, I used to wonder about how she could afford the luxury of having custom made furniture. Back in Australia, you have to be really wealthy to have your furniture made to order!.... now that we are here 'on the field', I finally understand. Having furniture made here is not quite the same as the Western world would understand it, furniture is made to order out of necessity rather than to have them made to a custom design. 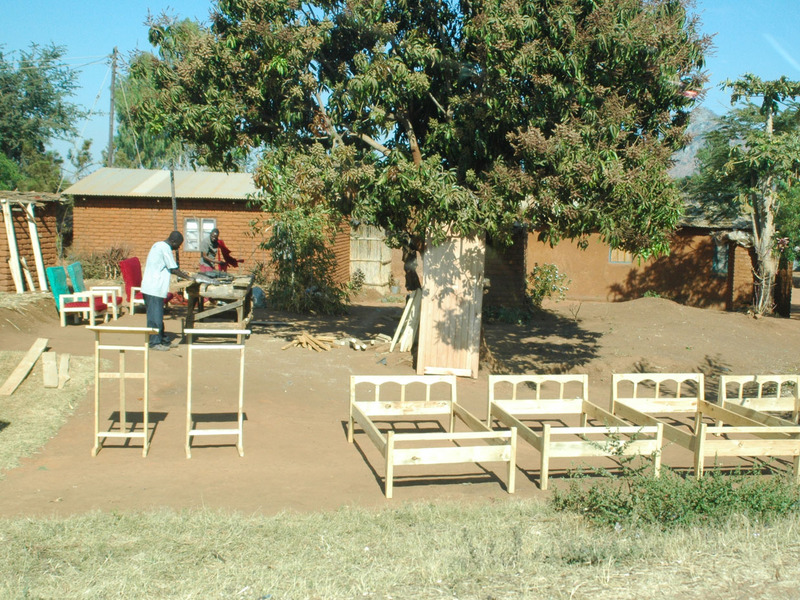 Ready made furniture are hard to find in Malawi, and if found, they are imported and very expensive. So instead of furniture shops, there are carpenters. 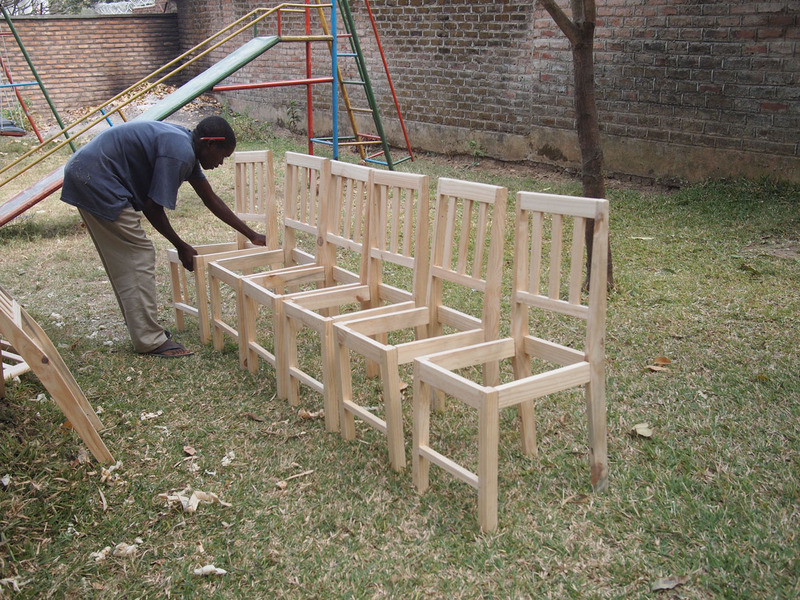 Carpenters generally don't make a whole lot of furniture in advance to be sold as some just cannot afford the timber without an order. Those who can afford it may make a few items and sell them by the side of the road. Some of these are made of wood, some out of cane. Ordering your furniture from a carpenter is more or less like the way you would purchase furniture from Ikea, but instead of pulling it off a shelf, they have to go and make it first! 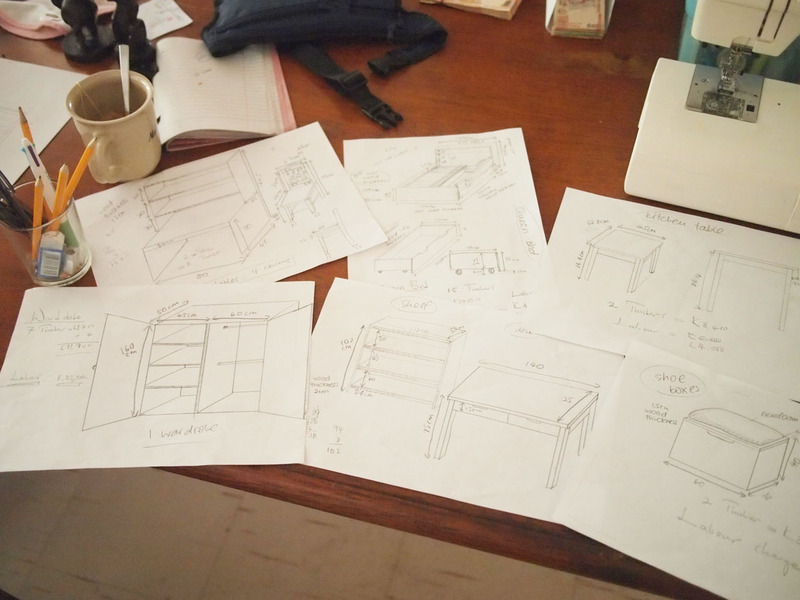 Making furniture takes time. There is no Bunnings here where carpenters can purchase neatly cut pieces of wood. Instead, they go to a timber yard and purchase rough pieces of wood which then need to be dried in the sun and then planed before being made into anything. 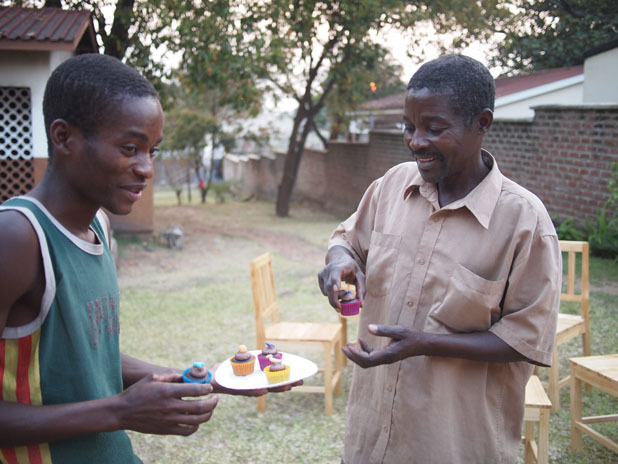 We love the fact that we are supporting a local Malawian. Mr Mafunga our carpenter has 6 kids and live far from where we are, which is why has has to stay with us while he worked on our furniture. He and his two boys sleep on thin mats in the workers quarters and eat mostly nsima (like a maize porridge) for meals. They are doing a fantastic job and I'm enjoying putting my industrial design degree to good use! No more weeks to go!! We have departed Sydney and have just arrived in Singapore for a week of rest and refreshment before leaving for Malawi on 18th July. What a hectic time the last 4 weeks have been! Much of that time was spent packing. 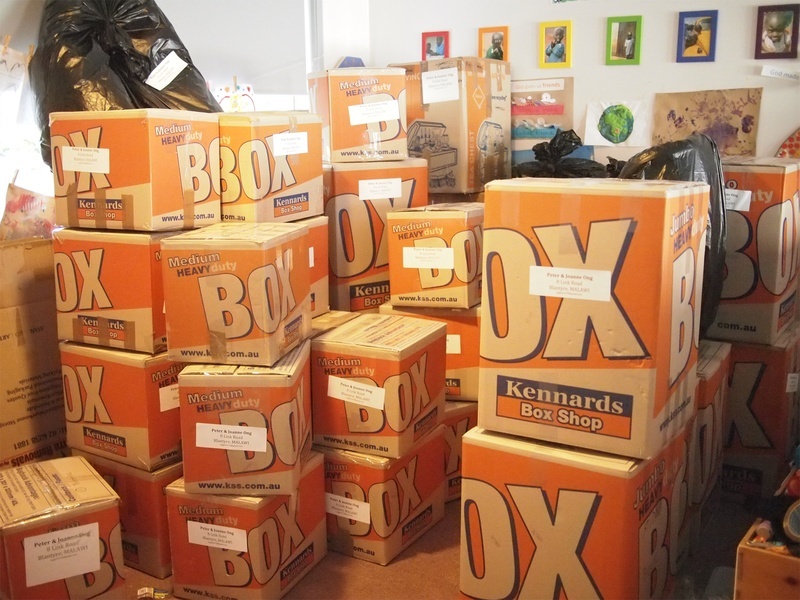 First packing our boxes to be sent to Malawi, then packing to move out of Morling college, then packing suitcases to leave for Singapore. On top of that was the passport fiasco but praise God that Jo finally got her passport... 2 business days before departure! Perfect God timing! So much of what has happened in the past 4 weeks had seemed impossible at the time but God has graciously made it all happen. He blessed us with physical strength when we were lacking in sleep, friends to help out when we needed it, encouragement where there was discouragement... and by HIS enabling, everything was made POSSIBLE. Saying last goodbyes was the hardest thing we had to do. It was difficult for us to say goodbye to close friends and family, but the part that broke my heart was seeing Teaghan sob as she farewelled her beloved Grammy (my mum). These two have a special bond. I know they will miss each other heaps. Sometimes I feel bad that I'm taking Mum's only grandkids away. On the night before departure, I was blessed to be able to spend some time, in the midst of packing, talking with Mum and crying together with her. I shared with Mum my worries for her as she grows old in my absence. She shared with me that back in 2004, she was reading the biography of Hudson Taylor and read that his mother was 72 when she saw him off to the mission field for the first time. God put it on her heart then that that would be Mum one day, that she would see her own child off to the mission field at age 72. In 2004, Pete and I had only been married for a year and only just beginning to work out what being called to missions meant for us. We didn't share with Mum the timing of when we wanted to leave (we had originally planned for 2010) and she didn't share with us what God had put on her heart as she didn't want that to affect us as we worked out his calling. And so the day finally came for us to leave for the mission field, farewelled by my 72 year old mother whose heart God had already prepared to one day release her child to do God's work overseas. May that be an encouragement to anyone who might worry about how their parents may react to their serving cross-culturally. God not only preapres those heading overseas to expand his kingdom but also those who are close to them.